Before the invention of refrigeration people would use cool spaces for storage, like basements or dark chambers. The city of St Louis was known for it’s many underground caves. The caves were known as being good places to store alcohol. Beer companies were especially fond of the caves. But being dark and damp, so were thieves. There are stories of slaves on the run using the caves to reach the north and tales of gangsters using them to store booze during prohibition years. Given how far the caves stretch such claims are believable. The city was built up on a vast network of caves and tunnels. Many of it’s caves are the subject of urban legends or folk tales. But one cave is more mysterious than all others combines. Few people know about it – and of those who do, some don’t even believe it exists. It would be easy to prove them wrong if not for one problem… no one knows where it is. The caves today are not like they once were. Many have been filled in with rubble, a by product of the city’s growth. Others were closed to the public. But one was deliberately sealed so that no one would ever enter it again. It’s known as English cave. The name used by natives has been neglected by history. So it’s current name is drawn from one of it’s previous owners, Ezra English. He and his brother in law were successful brewers of ale. On realizing how naturally cool the caves were he purchased one and moved his brewery inside. He was the first in Saint Louis to do so and it seemed like a good move. But before long the business failed. Their plan was to turn the caves into a tourist attraction. They built grand gardens and organized hot air balloon rides for visitors. This was a huge financial risk, and as a cholera outbreak devastates the city above, they simply didn’t attract enough business. Closing the brewery caused his brother in law to attempt suicide. He stabbed himself, but survived only to die one year later of a more painful death. Not long after, Ezra English disappeared from the historical record. It’s said he died an equally painful death. This was in the 1850s. 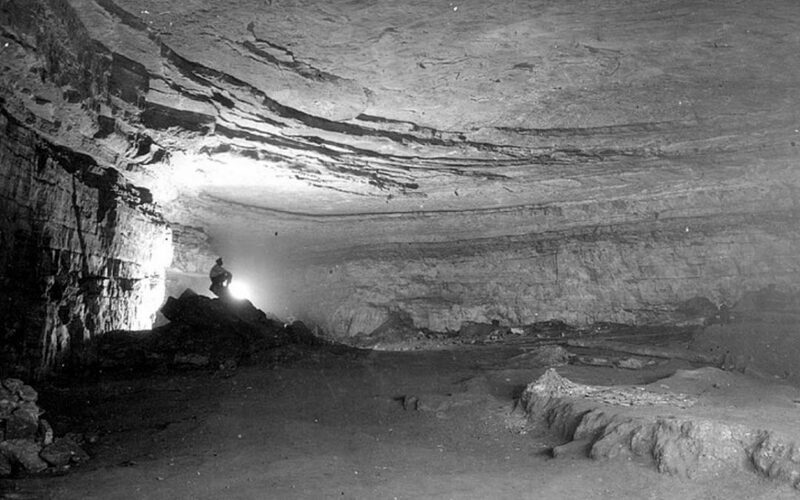 In 1887 the cave was bought by two men who planned on farming mushrooms inside it. But after failing in business and being met by personal misfortune, English cave was abandoned. Ten years later a local wine company bought the cave. They used it for storage but soon went out of business. The English cave was once again abandoned. Bad fortune fell on every single owner of English cave. It was said that just entering the cave can ruin a person’s life. By the early 20th century various legends explained what happened to the cave, all of which involved it being cursed. One legend tells of a native American couple many centuries ago. The woman was ordered to marry a different man so they fled into the cave. The man promised her hand in marriage gathered a group of warriors. The warriors kept guard outside of the cave until the lovers inside died of starvation. In the early 18 hundreds, Europeans first explored English cave. On discovering the remains of the two lovers, and disturbing their resting place, a terrible curse was released. And from that day, entering the cave was a great risk. It’s unknown how much of that story is true. We know the cave’s entrance was sealed up around one hundred years ago. But we don’t know why. There are two stories to why it was sealed. The first tells that an above lake was found to be leaking into English cave, and that it must now be full of water. The second tells that it was sealed simply to protect people from the curse. Knowledge of the cave faded into obscurity. Until the 1960s, when two historians learned of it. They carefully searched for the cave, with a pickaxe ready to break into it. But they were not able to find English cave. Their attempt to do so was well publicised and many have since tried to find and enter the cave. This gave rise to another legend that the cave physically disappeared after being sealed, and that only the tragic death of two new lovers can bring it back.